But circumstances in America and the world are such that children are dying before their mothers and grandmothers. Seeing a mother in a funeral parlor, grieving over her son who was shot down through the violence in the streets, feeling the pain of these mothers, fathers, grandmothers and grandfathers, gives way to great joy, knowing that you are making the effort to bring peace to the streets that you now control, to a degree. When we practice peace, there has to be certain laws that we follow in order to bring peace. I cannot steal from you, yet offer you peace. I cannot come in your house, after your sister and desecrate your family, yet offer you peace. I cannot know that you are married and want your wife, yet offer you peace. I cannot sell drugs to destroy your household, yet offer you peace. If we mean peace—because there is too much hypocrisy around the word “peace”—then what supports our peace has to be the principle, “I treat you like I want you to treat me.” This is a code of righteous conduct. Peace with a righteous code supporting it produces love. But now, if somebody can kill our Christian family and we, as Muslims, do not feel their pain, then we are disconnected. If somebody can hang one of our Brothers in Georgia and we read about it in Newark, but do not feel the pain, then we are not tied to each other. In the ’60s, we could not watch television in Newark and see dogs and firehoses aimed at Black people in Alabama and Mississippi, and not feel the pain. That’s why when Martin Luther King, Jr. was shot down, 100 cities were set on fire because of rioting in the streets. You may not realize that part of the strategy of the government is to put you all against each other. If the enemy sees you trying to organize, he will send people to organize you. He says, “You have a spirit to come together, but I am going to make sure that whoever leads you is my man.” This is the way the enemy thinks. He always sets up a counterweight or a countermovement. Do you know that in the 13th Amendment, which says that slavery is abolished, there is a clause that many do not mention, that states, “except that when you are charged with a crime.” They are locking up our Brothers and Sisters all over the country, and when you are incarcerated, you lose your citizenship. This is a clever plan of the enemy. The Latino family is growing, so if Black gangs get tired of fighting each other, the enemy will produce another fight for you. They urge you on, saying “The Latinos are growing in power and you have to do something about that.” So, all of a sudden now, you find Black Brothers fighting their Latino Brothers. You all are being played against each other to somebody else’s benefit. When the police stopped you today, they asked each other if they had a warrant on any of you. You call it harassment, but it is also another means of placing leaders behind bars, where they can make a punk out of you. Now, America sees the Judgment of God on her. Throughout the countries of the world, dislike is increasing for America. Anti-American sentiments are so bad now that they give travel advisories to Americans. : “Don’t go here. Don’t go there.” Americans even find it difficult to go to London, because the euro and the British pound weighs more than the American dollar. So, if you go to London, you have to spend a lot of money for little things that are much cheaper in America. The American dollar used to dominate the world economy, and if someone paid us, we would betray each other out of greed for money. I am warning those of you who think money is God, the wise economists are predicting that the dollar is going to collapse. 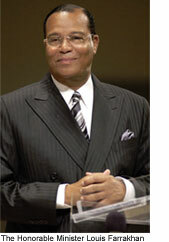 After the dollar collapses, the government will collapse, as the Honorable Elijah Muhammad told me. Those who think that they have security in a dollar bill, rather than in God and the unity of their people, will cause blood to run in the streets. Then, the next stage in community development is a Crip and a Blood getting elected to the city council. I heard that one of the Brothers told a city councilman, “We decide whose sign goes up, whose sign goes down in the streets that we control.” But suppose it’s your picture going up? Suppose you vote your man into office, and when your man is in, he has to represent the people who do not have any representation. And if those people on the city council refuse to divide the budget fairly, vote them out of the council and elect somebody who has your concern at heart.Then, look at the budget for the city’s schools. You may think that I am getting carried away, but I do not want to see my Brothers lose the promise of God.